These 5 images of old Reading date from soon after 1890 and were possibly taken by Reading Photographers Dann & Lewis who took the famous water tower panorama images about the same time. The originals mounted on board are currently in my possession and are so faded that they are almost orange. So these are the repaired versions. I have tried to describe them, based on sketchy notes on the back of some [with help from David Ford and others] – if you know better, please let me know. 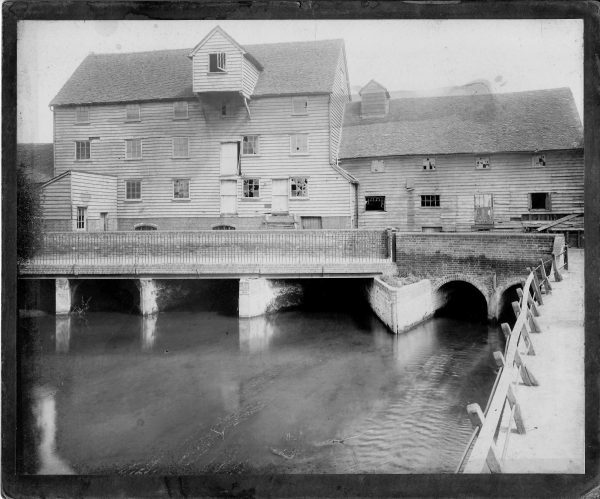 Save for the 2nd image, St Giles Mill that is also in Reading Museum’s collection, these do not seem to be in any other Reading Archives – so may be unique to this site! I donated the original images to the Berkshire Records Office in 2017. St Giles Mill belonged to John May [1758-1857] & his brother William May [1780-1862] sons of the May Brewery of Basingstoke founder, Thomas May [1737-1800]. 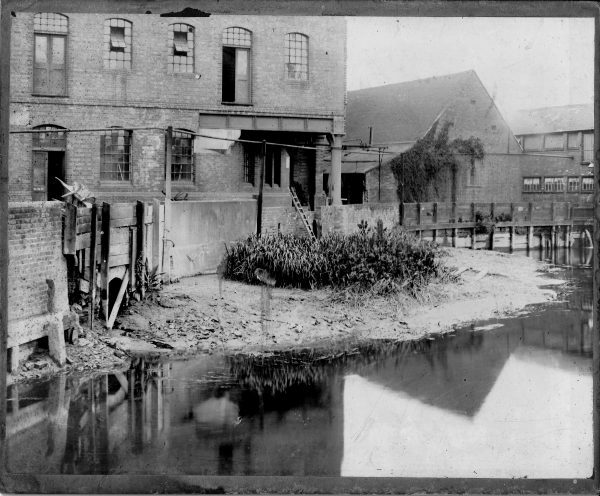 This view over the River Kennet taken from Mill Lane, shows the mill in disrepair with broken windows. Simonds Brewery along the River Kennet. Taken from the northern corner of Baynes & Beard’s Timber Yard, looking across at the Malt Chambers & the Vat House. 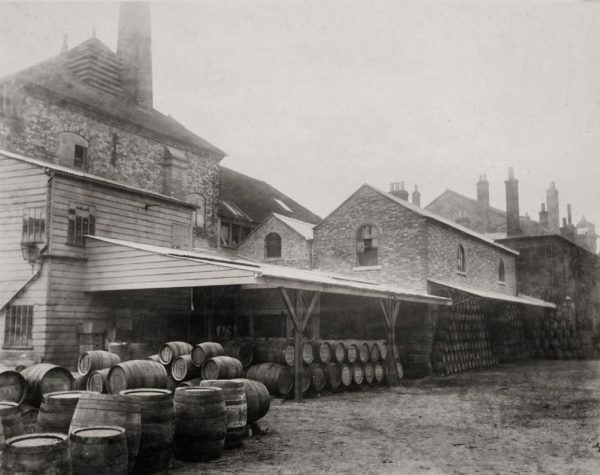 This view of the Cooperage & Cask washing area may be from the same date – or a little later. Taken from behind the Timber Store at Baynes & Beard’s. The building on the right is the Timber Store. The one on the left is the Simonds Cooperage & Cask Washing Shed – itself at the back of the brewery, facing the stables. The old Water Tower across the far side of the Kennet from the brewery site. Seems to have been taken from the edge of the river under the Malt Chambers shown in Images 1 & 3. It shows what was probably the Mill House, then the Water Tower, then a store house. The building with the prominent chimney is the Offices of the Waterworks Department. In the distance are the houses across the river in Mill Lane. I love the detail – showing the man standing in his doorway beside the tower – watching. This area included the Minster Mill and also belonged to John May & his brother William May as they were in partnership. 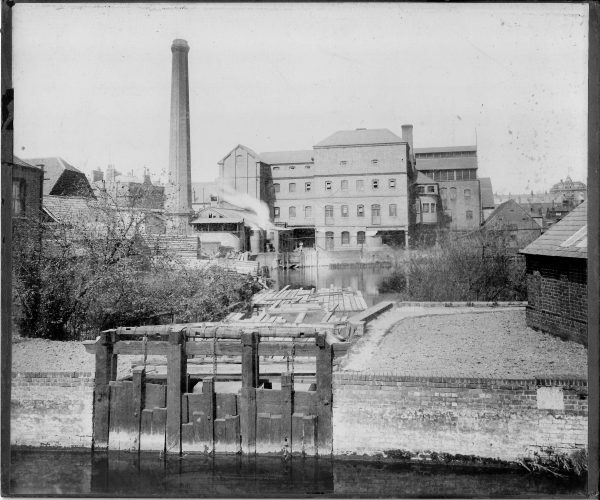 In 1820 they sold the land adjoining the mill to the Reading Waterworks who then built the water tower in the picture. 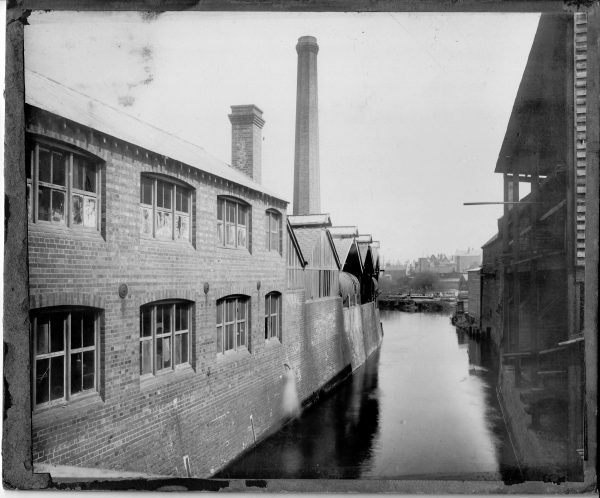 They retired to Churchgate in Caversham and William sold the mills in 1860 to Rowland Charles Hurley. The May family were good friends of the Simonds family, marrying each other 3 times in different generations. They sold their Basingstoke Brewery to H&G Simonds in about 1947. 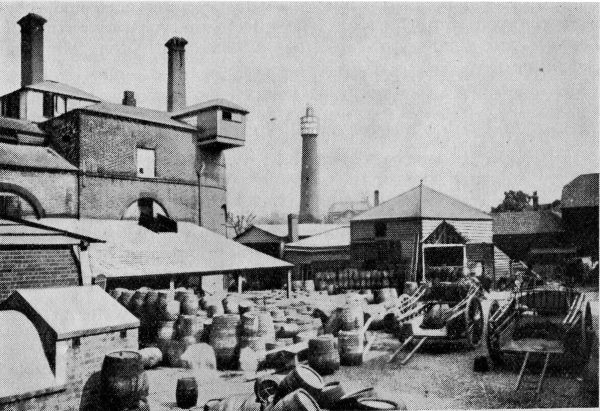 The water tower was the location used by the Reading Photographers Dann & Lewis somewhere between 1895 and 1902 to make the fabulous panoramic image of Old Reading and the brewery. Also on this website timeline. I found these images in the official H&G Simonds company archives, once the property of Heineken UK, and under their archivist Ken Thomas, when they and 100’s of others were generously loaned to me in 2017. They are now housed safely at Berkshire Records Office. This last image was published with no explanation in the Hop Leaf Gazette of April 1939. 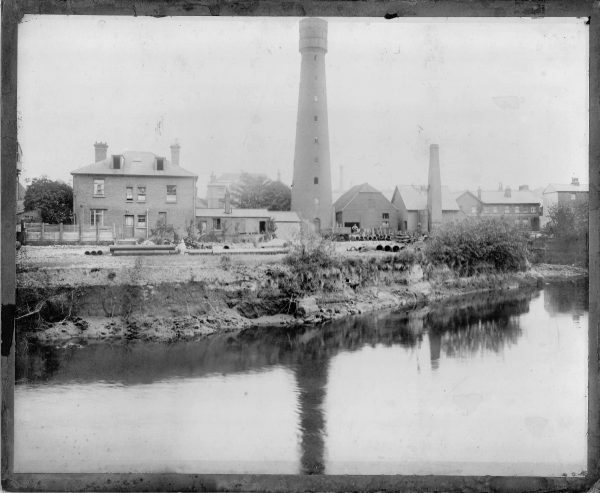 It has to be from the same set and again shows the Mill Lane water tower, from the Coopers Yard. 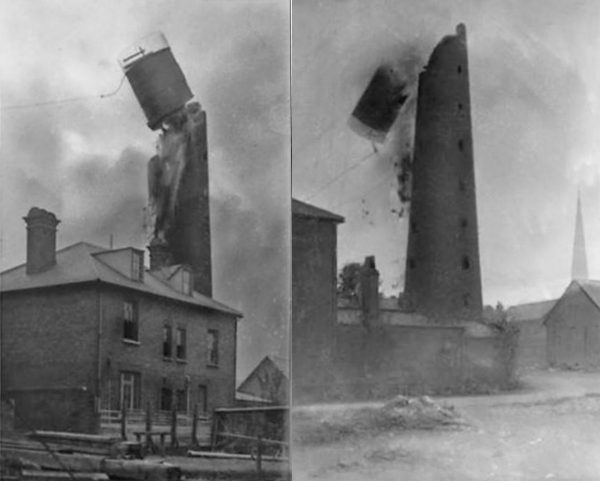 The Mill Lane water tower was demolished between 1902-1904. If any viewer can improve on that, please tell me! These are images of the demolition, again by Dann & Lewis and are I believe in the MERL archives.